Watch out graphene; something's coming to eat your supermaterial lunch. Nanocellulose is poised to be the kevlar-strength, super-light, greenhouse gas-eating nanomaterial of the future. And the best part? It's made by nothing but algae. If we can complete the final steps, we will have accomplished one of the most important potential agricultural transformations ever. We will have plants that produce nanocellulose abundantly and inexpensively. It can become the raw material for sustainable production of biofuels and many other products. 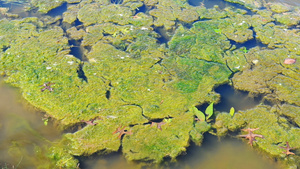 While producing nanocellulose, the algae will absorb carbon dioxide, the main greenhouse gas linked to global warming. Cellulose, in its macro form, is one of the most abundant things on the planet. That's what tree bark is made out of. That's the fiber in your bowl of shredded wheat. But like so many other things, cellulose is a different beast at a sub-nanometer scale. Remind you of anything? When nanocellulose is tweaked just right—chained into long polymers or crystalized—it could be put to use in super-light body armor, biofuel, new thin displays, making ridiculously light aerogels, even growing replacement organs for transplants. The stuff has serious potential. Initially, the production of nanocellulose involved huge breeding tanks of bacteria, which rather annoyingly required things like food. But recent advancements have helped groom a new workhorse: blue-green algae, which unlike normal bacteria, can make its own food from the sun, and devour greenhouse gases in the process. You could hardly ask for more.